Thank you for expressing an interest in joining our club. 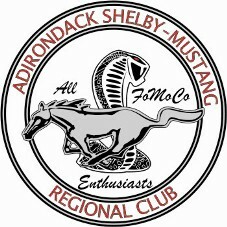 The Adirondack Shelby-Mustang Regional Club was originally founded in 1980 as a Shelby and Mustang only club, but has evolved to what it is today. That is, a Mustang Club of America Regional Club open to all Ford enthusiasts and their families, with an emphasis on the Ford Mustang. It is not necessary to own a Mustang, or even a Ford for that matter, to be a member. The level of participation of each member is totally dependent on that person’s interest and availability. During the year some of our activities include: Promoting a daylong mustang and all FoMoCo Car Show at Jack Byrne in May, promoting a daylong open car show at Metro Ford in August, promoting a daylong open car show at Browns Ford in September, sponsoring weekly summer cruise-ins at the Harbor House Restaurant, caravans to other auto events, field trips, seminars, volunteering for local charities, bi-monthly Saturday evening dinners, a summer picnic, and a Holiday party. Partial proceeds from some of our events are donated to the Make-A-Wish Foundation of Northeast NY and other local charities. We publish a monthly newsletter that is mailed or e-mailed to your home around the first of the month. We have monthly meetings (January through November) day/location as indicated in the newsletter, Facebook or on our website. If you wish to join, simply mail a membership application with a $20 check or money order made out to the club, to P.O. Box 4427, Halfmoon, NY 12065, or bring them to a meeting or event. If you have any further questions, please feel free to call Walt Dugan at 518-265-6736 or send an e-mail to nyasmc@gmail.com.